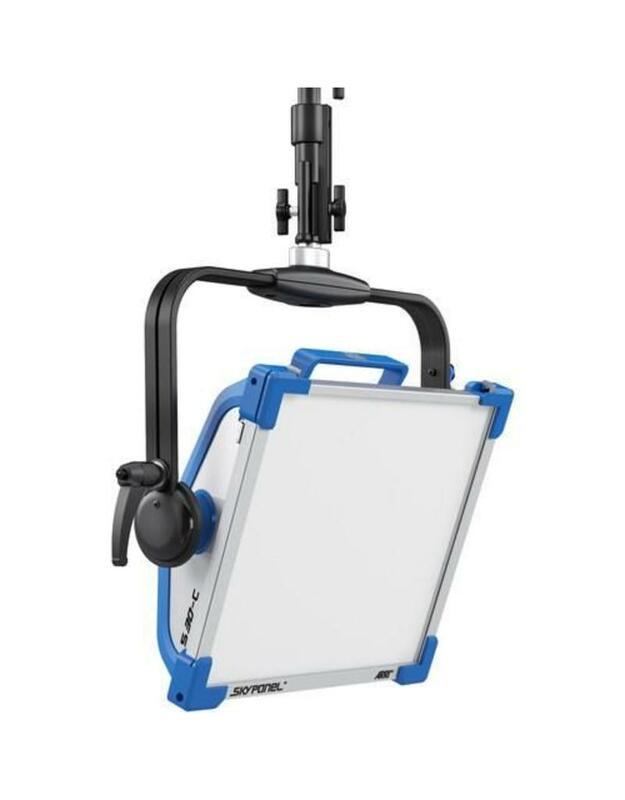 ARRI continues to broaden their LED line and reaffirm their commitment to accurate color rendering with the introduction of the blue/silver SkyPanel S30-C LED Softlight. 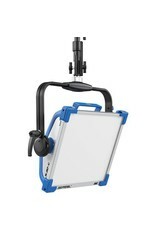 Supported by a manual aluminum yoke, the panel's surface area measures 14 x 11.8", making it an ideal portable, on-the-go light source for mobile applications. Output is controlled via interchangeable thermoplastic diffusers that range from Standard to Lite to Heavy to soften the light and wrap its output around your subject and the SkyPanel S30-C outputs the equivalent of a 1,000W tungsten soft light while drawing a maximum of only 240W. Using technology originally designed for the L7-C Fresnel, the SkyPanel S30-C is fully color "tuneable" allowing output of a warm 2,800K to icy blue 10,000K light and also uses the full RGB+W color gamut with hue and saturation control for fine adjustments. Full minusgreen to full plusgreen is also possible, so if you're lighting for blue or greenscreen, you can simply dial your color chosen in. This wide degree of control is responsible for a very high CRI of 95 and a rating of 91 with the newer TLCI standard. All of these functions as well as 0-100% dimming can adjusted locally with the SkyPanel's onboard controller or remotely via DMX or over a LAN. Besides inputs and outputs appropriate to these functions, the light also has a USB-A port for downloading firmware upgrades from a thumb drive, PC or Mac. 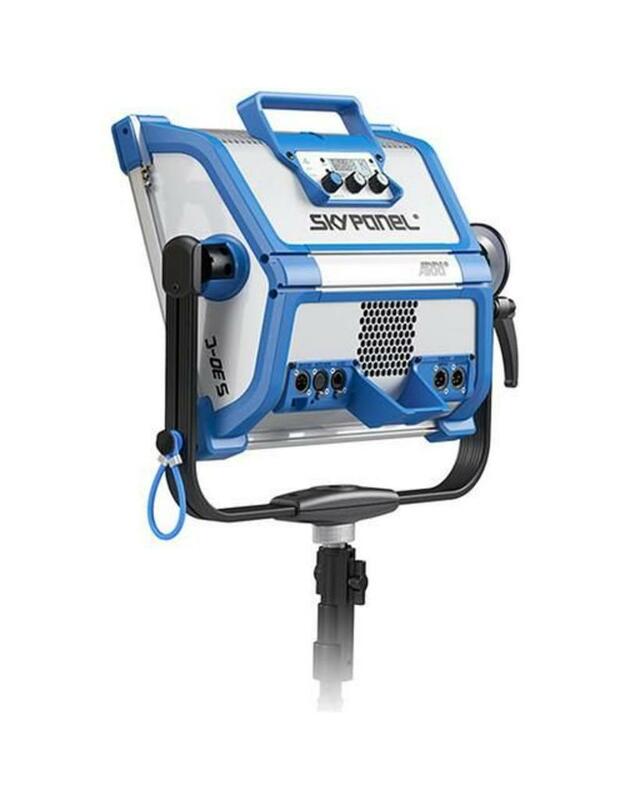 The SkyPanel S30-C can be used worldwide, thanks to its included 90-250 VAC power supply, but it can also use optional 23-36 VDC batteries when mains power is unavailable. Besides the power supply, the light comes with a combo baby/junior (5/8" | 1-1/8") pin and a standard diffuser. This version of the light comes with a 9.8'-long Edison DC power cable. Incorporating features of ARRI's successful L-Series LED Fresnels, the SkyPanel is one of the most versatile soft lights on the market, as well as one of the brightest. Like the L-Series, SkyPanel "C" (Color) versions are fully tuneable, meaning that correlated color temperature is adjustable between 2,800K and 10,000K, with accurate color rendition over the entire range. Full plus and minusgreen correction can be achieved with the simple turn of a knob, and in addition to CCT control, vivid color selection and saturation adjustment is also possible. Applications for this controllability range from quickly adjusting the CCT to set the mood of a scene, to selecting the chroma green output for green screen color keying. Each LED light engine is computer calibrated in order to ensure unit-to-unit and batch-to-batch consistency, as well as accurate color temperatures. Mixing calibrated red, green, blue and white LEDs into one homogeneous beam of soft light, the SkyPanel produces not just impressive light quality, but excellent shadows rendering as well. The soft shadows cut cleanly without exhibiting multiple edges or color fringing. - While the SkyPanel was designed to be used primarily as a soft light to illuminate people, various built-in features make it extremely adaptable to other uses. The diffuser panels on the front of the lamp head are interchangeable, so going from the Heavy to the Lite diffusion panel can be done in a matter of seconds. 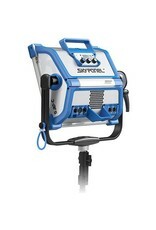 - With the onboard battery input, SkyPanel can be run off industry-standard batteries. The S30 can be operated at full power on battery power. - The SkyPanel also makes an effective space light outputting a large downward-directed pool of color controllable soft light through an optional silk cylinder. The SkyPanel user interface is designed for ease of use with a wide range of controls available to the user. Three simple knobs adjust the color temperature, green/magenta balance, light intensity and hue and saturation instantly. In addition to the on-board controls, all functions can be remotely adjusted via DMX or LAN connections.